I cannot overlook the death of John Szarkowski - a great mid westerner and the most important figure in spreading understanding of photography, and elevating the medium to its present status on a level with painting and sculpture as a means of powerful expression. There is an excellent obituary of him in the NYT this morning which explains all. 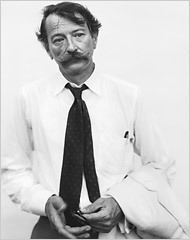 And it includes this portrait of him by Richard Avedon which I have "borrowed" for today. I hope that neither fine gentlemen would mind.